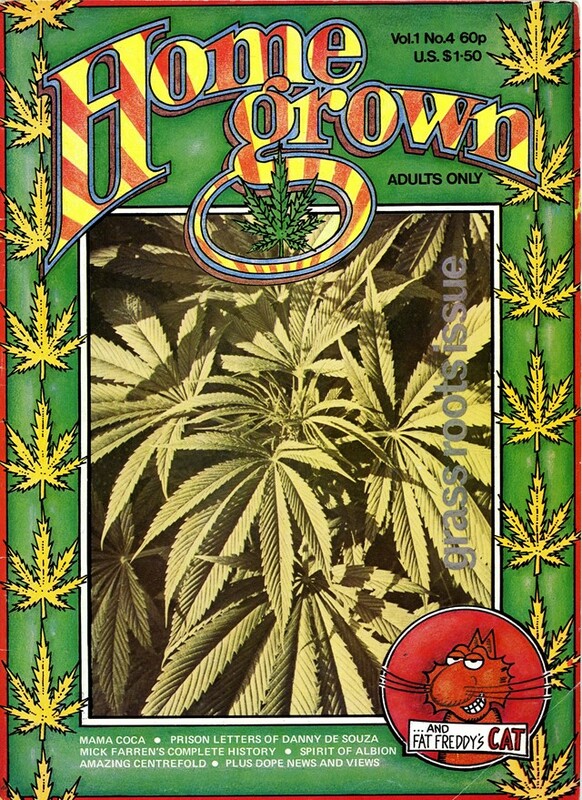 Surfacing in the early 70s, HomeGrown was one of the first magazines to centre its ethos around giving an alternate outlook on Cannabis. Activist and both editor and founder of the magazine, Lee Harris, fuelled Home Grown with the intention to enlighten the public and essentially "change the world", finding it necessary "to shock people" in his efforts. Through the years, the undoubted creative lived through various revolutionary eras and has participated in multiple protests sculpted to benefit the people – such as helping the Operation Julie defendants. Optimistic and bright-eyed, Harris’s work has inspired many and exposed truths about eras we romanticise and are nostalgic of, such as the psychedelic 60s and 70s. 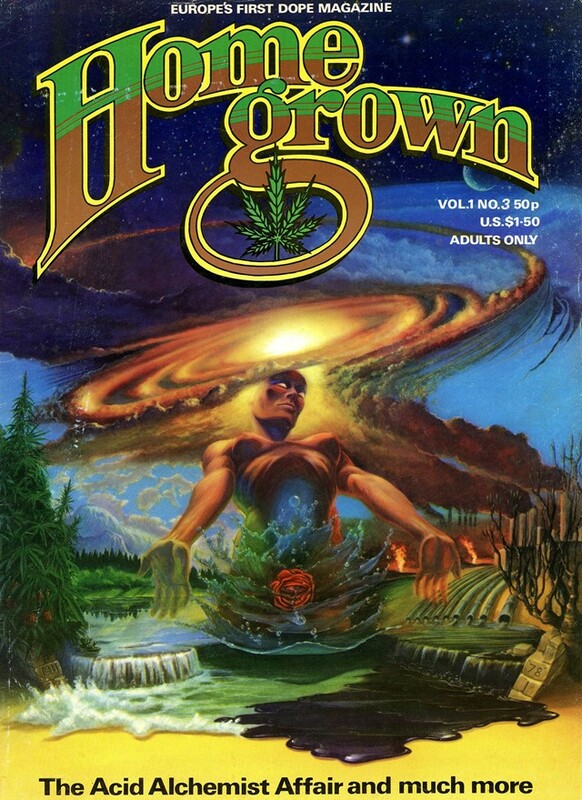 Now, with the help of YOUTH CLUB, Lee has archived all issues of HomeGrown for an online platform as an offering for people to delve into past issues of the magazine that was dubbed a "horror on the book shelves and threat to your children". Ahead of its celebration at The Archivist in Haggerston tonight, we tune in with Harris who talks us through an uplifting discussion on Home Grown's approach to drugs and his need to "inspire". Can you tell us what the atmosphere was like, living through a psychedelic era? Lee Harris: The atmosphere of that period has come back. I think you can see it in the wonderful demonstration of protests for (Dalston club) Passing Clouds that happened recently. It had a feeling of love and a sense of the flower power of the 60s. There seems to be lovely things happening, such as the fighting for the London clubs like Fabric and other colourful protests. There's a sort of flower power and people power. When I created the very first issue of Home Grown, it was to celebrate The Summer of Love of 1967 which was ten years before we were all in Hyde Park. The beautiful people in our kaftans and our floaty robes. All the girls had long, lovely hair with flowers and I think we are back to that happy era. I mean, it depends how you're wired up, of course. I'm wired up to positivity and so many people are wired up to negativity because they can only see the dark side of everything. I saw a woman on Saturday on Portobello Road and she said, "oh I used to live here back in the day and it's all terrible now" and I said "look, there are people dancing in the streets, two buskers, two lovely ladies..." I said "look, you're not noticing all of these lovely things happening!". So I think there are lots of nice things happening but people don't notice. Would you say that you are nostalgic of the 60s? Lee Harris: Well, there's a part of us that is always nostalgic and always will be. And if you lived during that time they always say "if you remember the 60s, you weren't stoned enough". People who really lived in the 60s just have the glow – a hazy glow. The big festivals now stemmed from the free festivals back then such as Glastonbury. My daughter goes to Glastonbury now and she books a year in advance online, and pays £150. I remember when I went to Glastonbury in 1979 and it was Glastonbury Fair which was a small little festival, and it was a free festival. Back then you wouldn't dream of going to a paid festival! There was lots of these little fairs and festivals all over the country, and there still is to this day. People listen to music and drummers drum. And I think London is the hub of that. What was important to you about creating a countercultural magazine that was centred around drugs? Lee Harris: Well it was mainly to enlighten people's views on cannabis because there was such a stigma attached to it. And it was terrible persecution at that time during the 70s because stop and search was used to racially profile people, especially Afro-Caribbean youth. And so, I wanted to campaign to change the laws. Looking back, it's been 40 years since I started and I think it's a long road but we are definitely getting there. The big 420 I went to in Hyde Park was the first legalised pop rally in 1967, and it was on the back page of The Guardian. I went with leaves in my hair, a moustache and a kaftan – we were the panoramic hippies. How did you want people to react to HomeGrown? Lee Harris: When I put out the first HomeGrown issue, it received a storm of publicity and I had a month interviewing journalists from all the press because half of them wanted to come out, if you know what I mean. There were a lot of people who wanted the magazine to be banned. In Scotland, there was a headline along the lines of "Shocking discovery at Glasgow Record Shop" where they had found a copy of my magazine and The Sunday People said, "this horror on the book shelves is a threat to your children" – and that was during the Punk era of 1977. I think I caused quite an international stir because it was Europe's first dope magazine. Sometimes it's necessary to shock society. What would be your favourite issue? Lee Harris: There's something in each that I love. I suppose issue 10 because it had good art and good writers. That's what I loved, and that's when it felt like it really took shape. Had you of decided to release HomeGrown tomorrow, would your approach be different in any way? Lee Harris: The lovely thing about HomeGrown is that it is vintage. It was type setters and dark rooms whereas everything is online and digital now. And it's quite liberating that you have to apply journalism both online and print now, but now you've got to realise the possibility that the online outweighs print. I have blogs to open up for the young with new ideas, where I will include live pages to offer help to young people with radical ideas – especially creative and artistic people. And I want to do this so that we can find a digital art, rather than a hand drawn. Home Grown was full of the most beautiful black and white illustrations at the peak where all we would see were illustrators. But now we have Photoshop, so magazines are beautiful pieces and even the adverts are quaint. And people shouldn't look back and say "oh I wish I was born 50 years ago", as there are lots of creative things happening now. And I hope I can inspire people to go out do something similar to Home Grown and it's great that people can do it online. I wanted to change the world, and I hope people can take inspiration from that. Do you think drugs still have the same stigma? Lee Harris: The times have changed. There is much more openness now. I did the London News on television because I was trying to get Londoners to talk about cannabis and now people are much more open and are happy to talk about it. The stigma has been lifted and that is very important. I guess it depends what job you do, sometimes. However, recently I made friends with a man named Tom Lloyd who is Oxford educated, and he is a policeman who wants to change the law. They called it Law Enforcement Against Prohibition. I found it utterly reassuring because you have more and more police turning a blind eye, and with this it is decriminalisation by stealth.